Book this seasonal tour only available in November and fully appreciate the beautiful leaves changing in the fall! 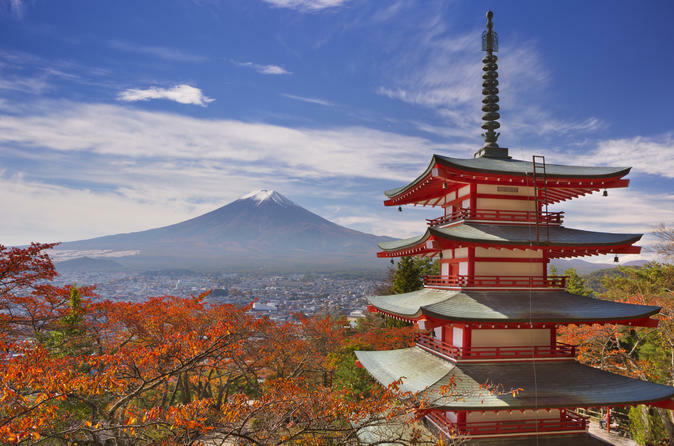 Enjoy a day away from the hustle and bustle of the city on this enriching full-day excursion from Tokyo to view stunning autumn sceneries and Mt Fuji. Visit the famed Chateau Katsunuma winery in Yamanashi prefecture to taste and find your favorite bottle of local wine. After, stroll around the Village of Dried Persimmons "Korogaki no Sato", and make a stop at the restaurant Shingenyakata for a delicious lunch of Matsuzaka roast beef and local specialty "Hoto" hot-pot. After lunch, check out Arakurayama Sengen Park, the famous photo-spot where you can see the 5-story red Chureito pagoda and Mt. Fuji at the same time. Then, spend some time discovering scenic fall foliage at Lake Kawaguchi. The last destination is Sagami Lake Resort Pleasure Forest, where you will experience the dream-like world of the illumination show. After an 8:00 am pick-up from the Gracery Hotel or an 8:20 am pick-up from the Shinjuku Washington Hotel in Tokyo, you’ll travel by coach to Yamanashi Prefecture. Known as a wine-making region, the prefecture harvests high-quality grapes. Sip on Japanese wine at the Chateau Katsunuma winery, and browse for bottles to buy and take home during your half-hour visit. Your next stop is the city of Enzan. Stroll around the Village of Dried Persimmons, Korogaki no Sato, for around 30 minutes, and see the persimmons strung together like beads and hung like curtains as they dry in the sun. Walk onward to Shingenyakata restaurant for a lunch of matsuzaka roast beef and the local hearty "Hoto" hot-pot, made with miso soup, thick noodles and seasonal vegetables. For those who cannot eat beef, an alternative meal can also be prepared (please specify your preference in the "Special Requirements" field at the time of booking, and also write what kind of food you can eat. Please not that this alternative arrangement cannot be made on the day of the tour). After the 1-hour lunch break, you’ll travel to Arakurayama Sengen Park to admire the views of Mt. Fuji together with the famous red-lacquered, 5-storey Chureito pagoda and a beautiful display of autumn foliage. The 30-minute walk to the vantage point takes 400 uphill steps, but once at the top, you’ll have over an hour to relax and enjoy the sights. Continue to Lake Kawaguchi for more vistas of Mt. Fuji amid a backdrop of fall colors. Then, head to Sagami Lake Resort Pleasure Forest to see the Sagamiko Illumillion lights display. The display is the largest of its kind in the Kanto region, showcasing around 6 million lights. After 1 hour strolling at there, you’ll travel back to the starting point in Tokyo’s Shinjuku area. Arrival is expected at around 19:00.